The looped string in your photos on your 987 looks like the equivalent of the velcro straps that formed a loop on the 986. If that is the case, both of these loops served the same function with regards to the operation of the convertible top. 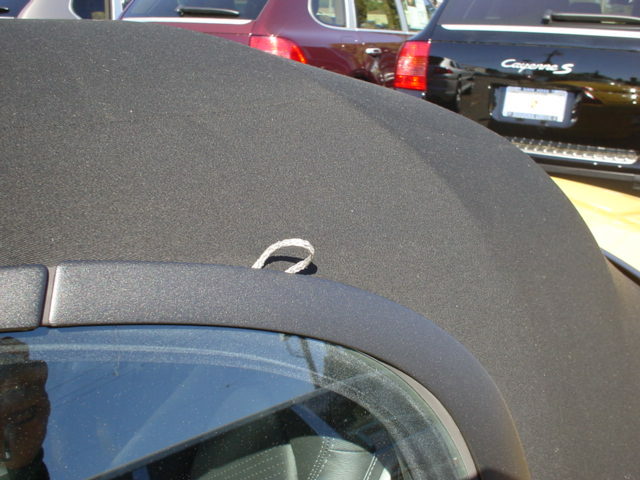 The "looped string" took the place of the earlier velcro straps. These velcro'd strap loops are supposed to ride (slide) up and down on a tubular frame member of the convertible top mechanism, as it goes up and down, so that the black plastic-covered cable that runs along both sides of the convertible top is pulled into the guide channel as the top closes. You can see in your first photo that the cable is sticking out somewhat of the guide channel that it is supposed to tuck into. 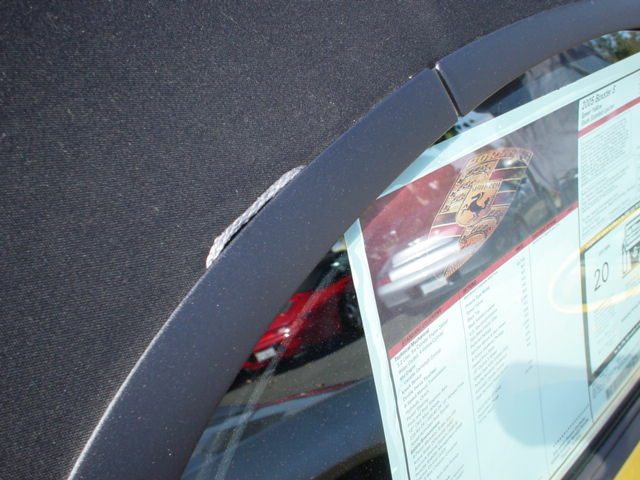 Your "sliders" (plastic parts at the base of the convertible top near the B-pillars) may have gotten jammed up and are no longer sliding back and forth on the nubs on the clamping rails, and that may be the reason that the looped strings snapped . There is no problem operating the top with these strings snapped, except for the aforementioned cables not going into the guide channel, and possibly a different fold when the top is all the way down. The article deals with all of the possible issues that cause the cable not to fall into the guide channel, and is geared mostly to 986's, but if you read the part about the velcro straps, you will understand the intended function of your looped strings. 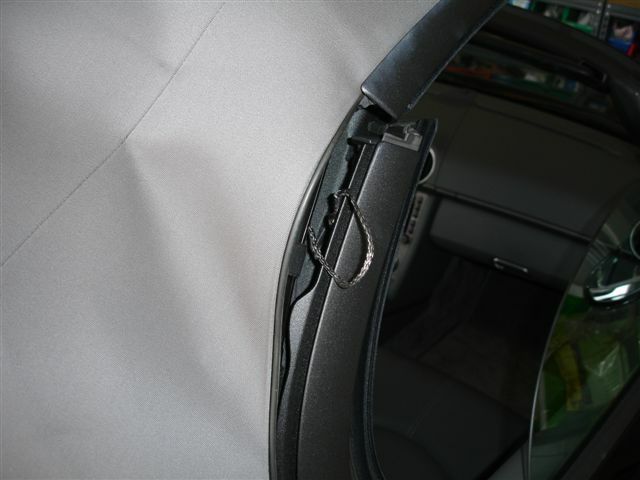 If the "looped strings" on your 987 are attached to the convertible top frame by means of a fastening screw on each side, then that part is called a "fold placer" and it is part # 987 561 773 01. The fold placer is actually two pieces of string that are connected to each other by being crimped on to a flexible elastic in between them. One of the crimped connections may have come apart near the center of the top, and if that is the case, you will have to replace the complete "fold placer". It runs left to right through a canvas channel and you can guide the new part with a long piece of wire, then attach the strings with the fastening screw on each side, then remove the wire. 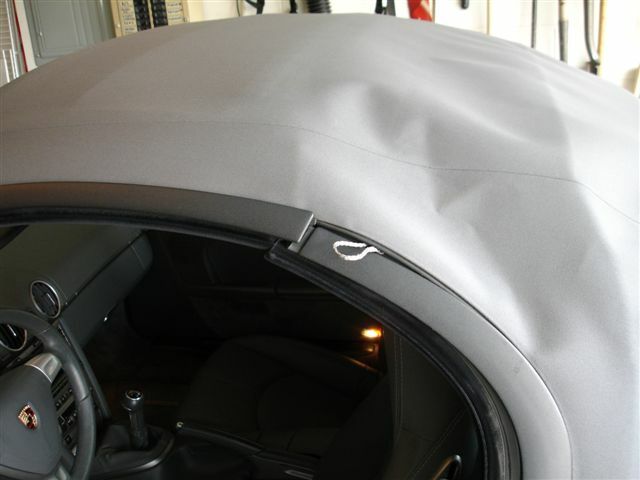 You will have to partially pull apart the convertible top liner to get at it. This was a problem when the 987 came out. I use to call it the shoelace. It has been so long I don't remember what the fix was, or if Porsche came out with a TSB. I assume you are still under the factory warranty, so take it to a dealer. Judging from that first photo, which shows a new car window sticker, that problem must have happened very early on in the 987's! If it is what I think it is, I wonder why they didn't stick with the velcro'd straps? It is the "fold placer" and it is part # 987 561 773 01. I pulled one side of the string and the plastic crimp was there, just missing the other string. I bring it to the dealer this morning for the repair. So walking out to my (05) 987 this afternoon I noticed 'the string'. As it will be a few days before I can get this to the dealer is it safe to operate the convertible top with the fold placer like this? There is no problem operating the top with these strings snapped, except for the cables not going into the guide channel, and possibly a different fold when the top is all the way down. (See Post #2 in this thread). I had this exact problem with my 987s whilst it was still under the warranty period. I think it must have broken long before it started to poke out of the side because unfortunately a white line appeared in the roof just in front of the bar that the string runs parallel to. In retrospect I thought this line was due to the effects of rain and sun on the roof whilst the string was laying out of position, but having read this thread it seems it might have been due to the roof folding into a slightly different position. Either way, I'm certain the problem was due to this broken string but the line did eventually disappeared after many washes and a single application of roof cleaner and conditioner.